German President Frank-Walter Steinmeier on Saturday said that it is the respect for the achievements of India and the people, which brings him to the country time and again. The German president made this remark while interacting with the media after meeting President Ram Nath Kovind and Prime Minister Narendra Modi at Rashtrapati Bhavan. "I have been to India several times but this is my first visit here as the President of Germany. I am coming here again and again because I have huge respect regarding the achievements in India, for the people and the country itself," Steinmeier said. 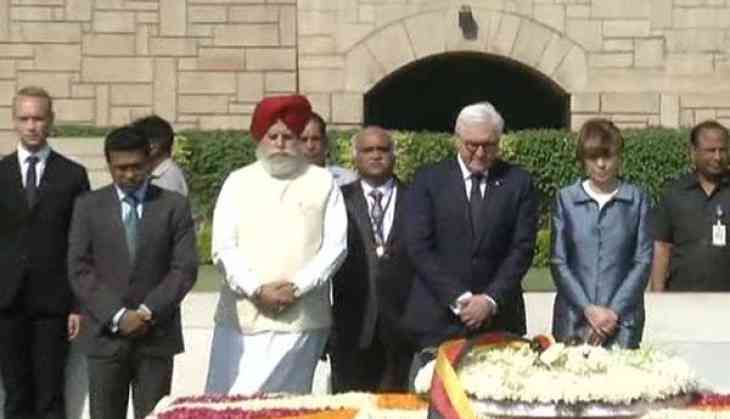 Steinmeier, who is accompanied by his wife Elke Budenbender, was even accorded with 'guard of honour' at Rashtrapati Bhavan. Later he paid floral tribute to Father of the Nation Mahatma Gandhi at Raj Ghat. Steinmeier arrived in India on March 22 to embark on his maiden four-day visit. The Steinmeier's visit to India is considered significant after German Chancellor Angela Merkel was re-elected to the German Parliament for a record fourth term on March 21.